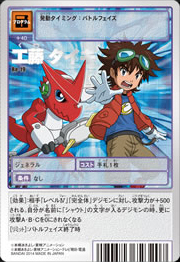 Kudou Taiki is the lead protagonist of Digimon Xros Wars, and one of the protagonists of Digimon Xros Wars: The Young Hunters Who Leapt Through Time. Taiki is an extremely caring and athletic person who tries his best to help out anyone who asks or who looks like they need his help. He does this to the point of pushing himself to exhaustion or just endangering himself in general. He's shown to believe in the best in others, including his rivals and those that would be his enemies. He is an excellent strategist, coming up with plans on the fly, and often deceiving opponents with cheap tricks and disguises. In Digimon Xros Wars: The Young Hunters Who Leapt Through Time, he ends up taking more of an exasperated, mentor roll to the other Hunters. 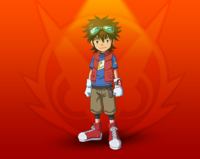 Taiki, as well as friend Hinomoto Akari and self-proclaimed rival Tsurugi Zenjirou, was drawn into the Digital World by the call of a dying Shoutmon. Once there, he met the newly-revived Shoutmon, Ballistamon and the other residents of Green Zone. Though initially wary of helping Shoutmon achieve his goal of becoming the Digimon King out of concerns of Shoutmon wanting the title out of mere greed, he relented upon learning of the Bagra Army and of Shoutmon's intention to claim the title to protect his people. One year later, Taiki has assembled a small street basketball team after school, named Xros Heart after his army; it's comprised of himself, Amano Yuu and Akashi Tagiru. Originally, Taiki did not have any access to his digimon while in DigiQuartz because all of his army was still in the Digital World. However, Wisemon managed to create a machine to transfer some of his friends from the Digital World directly to his Xros Loader, including his partner Shoutmon. Rather than hunting like Tagiru and the others, Taiki wants to help as many Digimon as he can. Taiki is the main playable character, whose army you control during the game as the protagonist. Taiki makes an appearance along with Omega Shoutmon in an extra scenario available after beating the main storyline, becoming a non-controllable member of your party for the special dungeon. Kudou Taiki is one of the Generals in the Super Digica Taisen card game. This page was last modified on 3 January 2019, at 17:53.